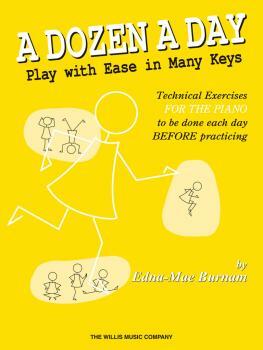 Edna Mae Burnam wrote these 32 short melodies in 1975, after the runaway success of the main core of the A Dozen A Day series. The book emphasizes playing in a variety of key signatures: major pieces are paired with the relative minor. Like the rest of the series, the short pieces are patterned and remain in five-finger position. The charming hand-drawings reflect the contrast in the mood and feel of the keys.